Today its my turn on the blog tour for The Tattoo Thief by Alison Belsham and I’ll be sharing my review with you all! Alison Belsham initially started writing with the ambition of becoming a screenwriter — and in 2000 was commended for her visual storytelling in the Orange Prize for Screenwriting. In 2001 she was shortlisted in a BBC Drama Writer competition. Life and children intervened but, switching to fiction, in 2009 her novel Domino was selected for the prestigious Adventures in Fiction mentoring scheme. 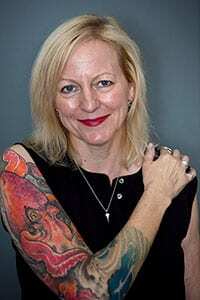 In 2016 she pitched her first crime novel, The Tattoo Thief, at the Pitch Perfect event at the Bloody Scotland Crime Writing Festival and was judged the winner. When Brighton tattoo artist Marni Mullins discovers a flayed body, newly-promoted DI Francis Sullivan needs her help. There’s a serial killer at large, slicing tattoos from his victims’ bodies while they’re still alive. Marni knows the tattooing world like the back of her hand, but has her own reasons to distrust the police. So when she identifies the killer’s next target, will she tell Sullivan or go after the Tattoo Thief alone? I really enjoyed The Tattoo Thief. I wasn’t sure what to expect going into it, but I found myself getting pulled into the story really quickly. I liked the tattoo angle, not least because I have a few myself, so it was interesting to read about. Marni Mullins is a tattoo artist, and she stumbles upon a body in a dumpster when taking a break at a tattoo show. Conflicted, she calls it in but then goes back to work at the tattoo show, not expecting anything to come of it. Until the police find her. What follows is a twisty-turny read with lots of things going on. DI Sullivan is investigating the discovery, but he has a lot more going on than what he’s letting on. I enjoyed reading about him and his thinking processes. I loved the interactions between Francis and Marni too, especially as the book progresses. Their back and forth banter is good fun to read. There is definitely a connection there, and I liked them both as characters. The Tattoo Thief is a really interesting crime thriller, told from multiple viewpoints, including the killer. It is graphic, and more than a little tense at times. Hard to believe its a debut! Today Ellen is taking part in the blog tour for The Tattoo Thief by Alison Belsham and I’ll be sharing her review with you all further down! The Tattoo Thief is one of those books that will really get under your skin…sorry I couldn’t resist! It is true though, I really struggled to put this book down and was walking round my house with kindle in hand permanently. It is a really fast paced, intriguing tale and the action kicks off early doors when Marni (tattoo artist) discovers a mutilated body in a dumpster. After phoning this in to the police anonymously she soon becomes deeply involved in the case as it becomes obvious there is a serial killer on the loose with a penchant for tattoos. Not just any old tattoo, this killer desires the best work out there and has a very specific wish list. The tattoos of the victims are removed while they are still alive so be warned this book is quite graphic and gruesome. As I’ve said before I’m a bloodthirsty soul so I really enjoyed these elements of the story. I also loved the relationship between Marni Mullins and DI Francis Sullivan, never a truer example of chalk and cheese have I seen! Marni is wary of the police due to past life events and Francis is an ardent church loving individual. Their worlds clash and both must bend a little to assist in the case. Marni Mullins was definitely my favourite character in this book and I’d actually like to know more about her life before her dealings with the tattoo thief. A fiery French ex-husband, time in prison and unresolved issues from her past…there’s another story waiting to be told! A fantastic debut and I look forward to seeing what is next from Alison Belsham.